The What: Open Mesh has introduced its first cloud-managed router, the G200, an addition that completes the company’s local network ecosystem and delivers end-to-end suite of cloud-managed WiFi access points, switches and routers. Complete with an integrated firewall and a quad core networking processor that provides full gigabit throughput, the G200 delivers best-in-class performance. The What Else: According to Ryan Detwiller, the company's general manager, the G200 is designed to advance the company’s mission of making networks smarter and easier to deploy and manage. When used with Open Mesh’s access points, switches and CloudTrax software, the complete system puts a several features at a network manager’s fingertips, including usage statistics, client management, and troubleshooting capabilities, as well as router-specific features, such as NAT routing, DHCP server, VPN client and point-to-point, VLAN tagging, and Quality of Service rules. This allows users to scale up to thousands of locations without on-site controllers or licensing fees, while still delivering gigabit throughput due to the quad core processor’s hardware offload and crypto engines. 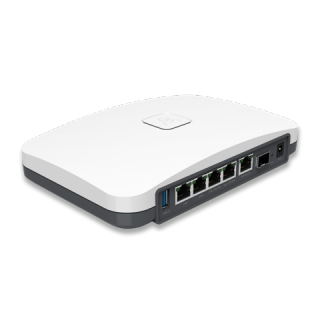 The G200 also incorporates passive PoE capabilities through two of its ports to provide power to the connected access points. “This a tremendous convenience, because it greatly simplifies the installation process,” Detwiller said. The G200 is available now and can be see at InfoComm 2018 in Booth C3202.